This tutorial provides you with a foundation for working with Adobe InDesign text frame options. It is the third lesson in the Adobe InDesign CC Digital Classroom book. For more Adobe InDesign training options, visit AGI’s InDesign Classes. Use text frame formatting options to control the vertical alignment of type, the distance text is inset from the edge of the frame, and the number of columns inside a text frame. Some of these options are accessible only within the Text Frame Option dialog box, while others are also accessible in the Control panel. In this exercise, you will change some of the text frame options for a text frame on page 2. Inside the Average Cell Phone Usage text frame, the text touches the side of the text frame. You will adjust the position of the text relative to the frame on the outside edge of the frame. 1 In the Pages panel, double-click the page 2 icon to center the page on the workspace. 2 Using the Type tool ( ), click inside the Average Cell Phone Usage text frame on page 2. 3 Choose Object > Text Frame Options to access the Text Frame Options dialog box. The keyboard shortcut to open the Text Frame Options dialog box is Ctrl+B (Windows) or Command+B (Mac OS). 4 When the Text Frame Options dialog box appears, make sure the Make all settings the same button ( ) in the Inset Spacing section is selected. 5 In the Top text field, highlight the current value, and then type .125. Press the Tab key, and the cursor moves to the next text field. Click to select the Preview check box, and notice the text is pushed in from the edge of the frame by .125 inches. 6 Click OK. The text has moved and is no longer touching the sides of the frame. Setting a text inset. The text inset from the edge of the text frame. You can align text inside a frame both horizontally and vertically. With vertical alignment, you determine whether text aligns with the top, bottom, or center of a frame. You can also justify the type so that multiple lines of type are evenly distributed between the top and bottom of a text frame. 1 With the Selection tool ( ) active, click to select the text frame containing the text Average Cell Phone Usage. 2 Choose Object > Text frame options. 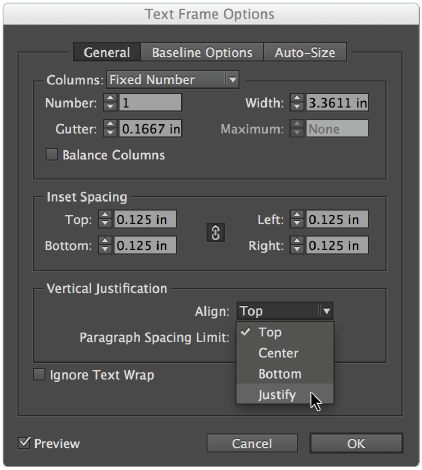 In the Vertical Justification section, choose Justify from the Align drop-down menu. Use text frame options to set the text to be vertically justified. You can also access the Text Frame Options dialog box by pressing and holding the Alt (Windows) or Option (Mac OS) key and double-clicking the text frame. Or use the keyboard shortcut Ctrl+B (Windows) or Command+B (Mac OS). 3 Click OK. Notice that the text now snaps to the top and bottom of the frame, although the text inset remains. 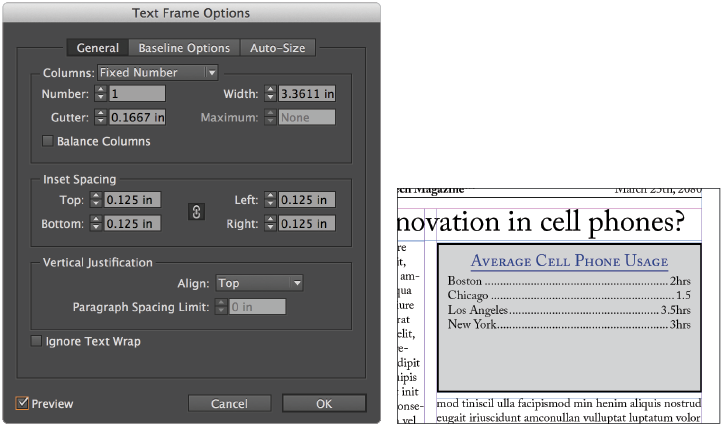 You can also specify that InDesign increases the width or height of columns as you enter additional text. Do this in the text frame options by selecting the text frame and choosing Object > Text Frame Options and click the Auto-Size button. This allows you to specify whether you want the text frame to grow in height, width, or both as additional text is added to the frame.